Graduations are meant to be a time of boredom – celebration too, but mostly boredom. You wait there for ages for your name to be announced, for a brief moment of adulation, before you hop off stage and suddenly start to think about the crippling debt you now face. Graduation would’ve been a whole lot more interesting if some of the parents at the ceremony had brawled like they did at Arlington High School in Tennessee. The graduation brawl allegedly started because one of the women wasn’t happy with the seating arrangements – seems a totally legit reason to punch a woman in the head. The two women were arrested and frankly it serves them right, they were absolutely brutal. My favourite bit is the look on the face of the woman in brown. It’s almost as if she can’t believe what’s happening. She was the worst one as well, throwing punches around like it’s nobody’s business. Apparently no charges are being filed against anyone involved, and so nothing will really come from the scuffle. This didn’t stop the graduation ceremony going ahead, and no one seemed to notice. 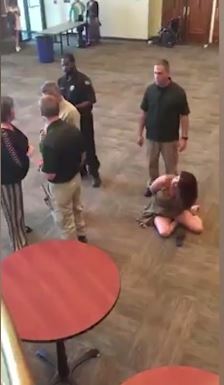 The graduation ceremony was not affected by this incident due to the actions of Bellevue’s security team who promptly removed the adults from the ceremony. It is our hope that the focus will shift to our students and their accomplishments instead of the poor decisions by adults in attendance. He’s got a point, but if I were a kid at this school I’d be pretty happy to have something to remember the day by. Can I just say that the reaction of the woman filming the video is absolutely amazing. She’s the real star of the situation here.